The Valley of Bones (VB) is the first of three volumes set during World War II. Perhaps as a result of the grimness of the early years of the War, it has the fewest references to visual art of all the volumes. Jenkins is isolated from his cultured friends, aristocratic homes, and the galleries of London, and Modernism no longer gets his attention. The title refers to the biblical book of Ezekiel (XXXVII: 1-10), on which Reverend Popkiss preaches at the end of the first chapter [VB /37-8]. This is not a reference to a painting, but we supply an example of a work that this passage has inspired to supplement the few images in VB. El Greco (1541-1613) was born Domenikos Theotokopoulos in Iraklion, Crete. He trained in Venice and Rome but spent most of his career in Toledo, Spain. He was best known for his portraits, and View of Toledo is his sole surviving landscape, which is not surprising since landscape painting was not in favor in seventeenth century Spain. He painted not for realism but for mood, conveying the threat of a coming storm (Zappella, khanacademy.org), an apt image at the beginning of the three volumes of Dance that cover the years of the War. El Greco started painting in a flat Byzantine tradition, which may help explain any liberties that he took with perspective. photo in public domain from the Yorck project via Wikimedia.org. Mastery of perspective long preceded El Greco. Masaccio (Italian 1401-1428) managed coherent depictions of space using linear perspective early in the quattrocento, and after Brunelleschi’s demonstrations of the geometrical basis of linear perspective mid-century, most Italian painting had lost that wobbly charm that Nick sees in the Welsh seaside village. At the same time, Italian portraits of single individuals posed in front of distant views of their domains only came into popularity late in the 15th century. We could find no example of a castellated township of Tuscany in a quattrocento portrait, with or without “great regard for perspective.” So probably Powell has inadvertently caused Nick to conflate two periods in Italian art history here. No matter, this Agony in the Garden by Andrea Mantegna (Italian 1431-1506) is an apt example of the effect Nick is thinking of. The castellated township here is meant to represent Jerusalem, and its internal perspective is pretty convincing, but it is seen from a point of view different from the several other points of view that Mantegna uses in this painting’s areas of interest. 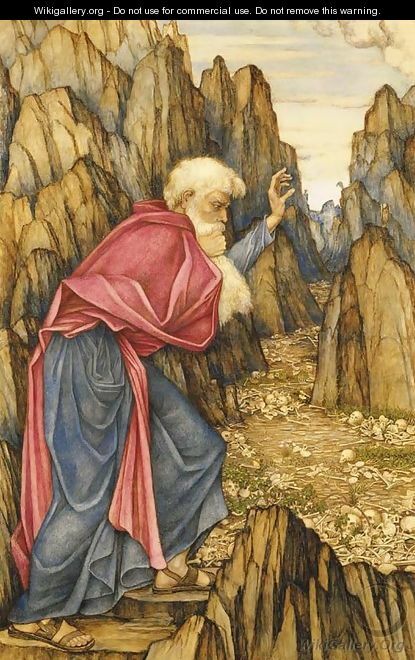 Brunelleschi had already shown that a convincing spatial effect was predicated on a single point of view, but Mantegna seems not to have consolidated an understanding of that concept in this painting. Perhaps at the time Mantega completed this painting Brunelleschi’s revelations had not quite made their way from Florence to the Veneto, where Mantegna lived and worked, but Mantegna had surely become one of the great masters of naturalistic perspective by the end of his productive life. Honoré Daumier (French, 1808-1879) is perhaps most famous for his caricatures, but he was a prolific painter, draftsman, printmaker, and sculptor, producing over 6000 works. There are extensive compendia of his art available on the Web (The Daumier Register). We have chosen to show The Third Class Carriage, rather than a church scene or a building interior, because it shows not only Daumier’s mastery of shadows but also the grimness that Jenkins experienced. The reference to Sardis comes from the Book of Revelation 1:11; Jesus says, “Saying, I am Alpha and Omega, the first and the last: and, What thou seest, write in a book, and send it unto the seven churches which are in Asia; unto Ephesus, and unto Smyrna, and unto Pergamos, and unto Thyatira, and unto Sardis, and unto Philadelphia, and unto Laodicea.” These places became known as the Seven Churches of Asia; here “churches” refers to communities of believers, rather than to buildings. Sardis, in Asia Minor, was the capital of Lydia, inhabited from at least the seventh century B.C. to the fifteenth century A.D., and today the site of ruins and modern archeological excavation. Jenkins describes Company-Sergeant Major Cadwallader as “cleanshaven, with the severely puritanical countenance of an Ironside in a Victorian illustration to a Cavalier-and-Roundhead romance.” [VB 10/6]. The English Civil Wars (1642-1651) pitted the Cavaliers (followers of King Charles I and King Charles II) against the Roundheads (Parliamentarians or followers of Oliver Cromwell). The Roundheads were named for their bowl-like haircuts; their troops were called Ironsides, because Old Ironsides was one of Cromwell’s nicknames. Many romantic novels have been written about this era. A pre-Victorian example is Sir Walter Scott’s Woodstock, or the Cavalier (1826). 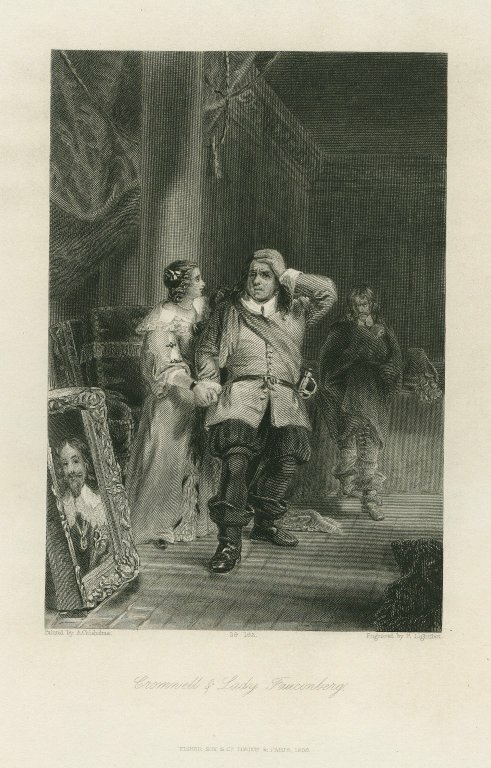 We have not found the illustration that Jenkins recalls, but the image at the left qualifies as Victorian (1837-1901) and shows Cromwell with a portrait of Charles I by Van Dyck. Another Victorian source of engraved illustrations is the history Great Civil War or The Times of Charles I. and Cromwell, written by Richard Cattermole and illustrated by George Cattermole. 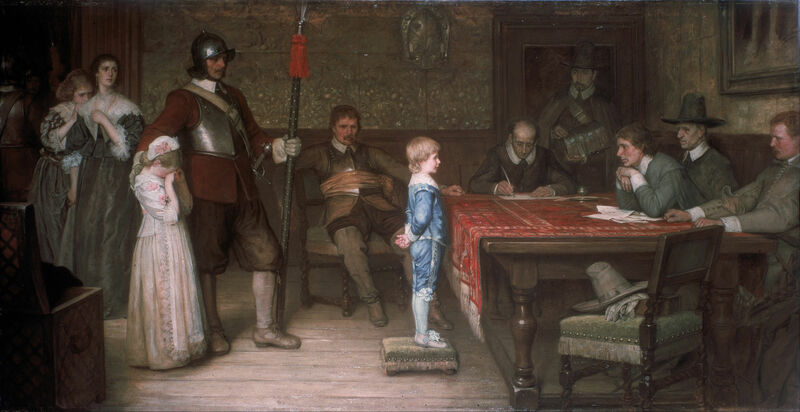 For a Victorian image of Roundheads, we can turn to the painting above by William Frederick Yeames. The Roundhead officer seated in the center wears an orange sash, which was characteristic Ironside attire. We know that the Ironside standing to his left is a sergeant because the halberd in his left hand is a sign of rank. To imagine Cadwallader, we will just need to shave the mustache from his stern face. “Almost all the officers looked alike to me at that early stage; Maelgwyn-Jones, the Adjutant, and Parry his assistant sitting beside him at the table as indistinguishable as Tweedledum and Tweedledee, …” [VB 13/8] Although these twins were introduced in nursery rhyme at least as early as 1805, their best known image is Tenniel’s illustration for Through the Looking Glass. Jenkins meets Captain Rowland Gwatkin, the commander of his company, early in VB, and Gwatkin is a central character of this volume. Jean-Louis Ernest Meissonier (French 1815-1891) painted small, detailed genre scenes, reminiscent of the seventeenth century Dutch style, purportedly because they fit the walls of Parisian apartments and sold much better than more grandiose canvases. Ruskin praised his work; his prices soared during his lifetime; at age 14, Proust called Meissonier his favorite painter, but Meissonier’s reputation was eclipsed by the Impressionists. We show Halt at an Inn and The Guard Room, now among 17 Meissoniers in The Wallace Collection, because Powell was very familiar with The Collection and was a great friend of its curator. (Between November, 2005, and February, 2006, The Wallace Collection mounted a special exhibition Dancing to the Music of Time: The Life and Work of Anthony Powell.) Perhaps Powell imagined the grenadiers at the tavern based on small panel paintings like these. 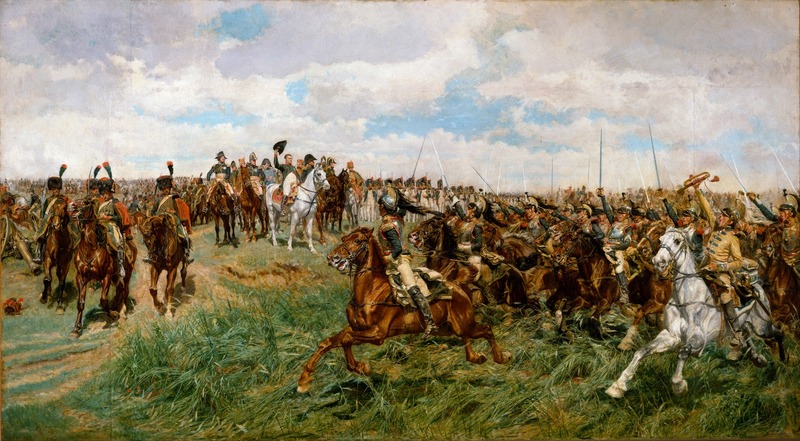 Later in his career, Meissonier turned to painting larger canvases of scenes from military history. In 1859, he was commissioned by Napoleon III to illustrate some of his military campaigns. These military canvases show many dashing figures for Gwatkin to emulate. On a tiresome train ride to London, Nick takes up conversation with an un-characteristically cultured fellow officer called David Pennistone, destined to become his long-time friend. Pieter Bruegel the Elder (Dutch, 1525-1569) is the beloved, enigmatic painter whose scenes of peasant life are the source of much of what we know about rural mores in the Low Countries of the 16th century. He studied in Antwerp with Pieter Coecke van Aelst and married his daughter. His sons Pieter the Younger and Jan also became painters; Pieter the Elder was born Brueghel but dropped the ‘h’ from his name; his sons restored it to theirs. Breugel’s Hunters in the Snow of 1565 is one of five surviving paintings depicting the months of the year and their occupations. Hunters in the Snow remains at the Kunsthistorisches Museum in Vienna. The Kaiser Friedrich Museum was renamed the Bode Museum after the War, and Two Chained Monkeys has been moved to the Gemäldegalerie, another branch of the Berlin State Museums (Staatliche Museen zu Berlin) .